As Kurukshetra war was coming in few days, both Pandavas and Kauravas were busy in building up their armies and extending their strengths to showcase in the great battle of history. Normally Kauravas have more army in the form of warriors and horses and elephants when compared to Pandavas. Both Kauravas and Pandavas wanted to seek help from Lord Krishna to strengthen their powers in war. 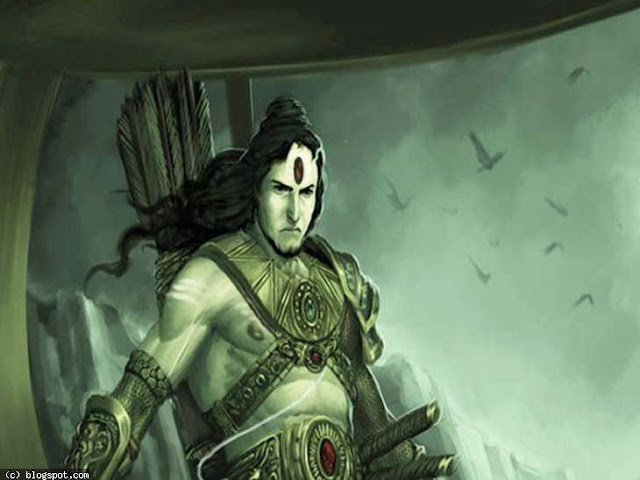 So from Kauravas side Duryodhana and from Pandavas side, Arjuna stood up to the task and ready to go to Dwaraka, the city of Krishna to seek help. Lord Krishna has a well-trained army with 10,000 warriors. 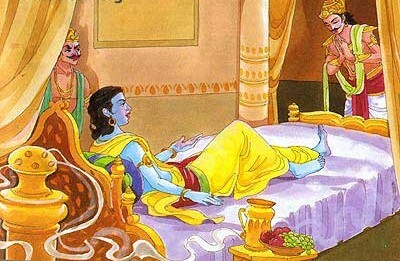 At first, Duryodhana came to Krishna, he found Krishna was sleeping. But Krishna was pretending because he knows everything before what was going to happen. So pretending like sleeping. Then Duryodhana came up and sat down. Duryodhana saw that Krishna's legs were pointed at him. He did not like it so he went and sat close to the head of Krishna. After sometime Arjuna came up and sat at the legs of Krishna and waiting for him to wake up. Krishna started to pretend to wake up. Then he saw Arjuna was sitting near his legs. So he told like "Oh Arjuna you came" and Arjuna replied "Yes Lord I came", then Duryodhana tried to show his presence to Krishna he made small voice with his throat. Then Krishna told like "Duryodhana you also came". Then both Arjuna and Duryodhana said that they came here to see your help, Krishna. Then Krishna said like these "Both of you came here for the same thing, so I am making it clear that what I have to offer for you both. I would put one side all my army and another side myself. But I will not fight in the war but always be with you". Then Krishna gave the first choice to Arjuna and asked him to chose what he wants. Then Duryodhana interfered and said like this "I came first so I deserved the first choice". But Krishna said first I saw Arjuna so first choice will go for him. Arjuna said like this "Oh my lord I want you with me, I did not care about army". After hearing these words Duryodhana was very happy because he got 10,000 warriors and started thinking like this "Arjuna was the idiot he chosen one man against 10000 men". So both of them got their rewards from Krishna. But here this single choice made the biggest difference in Kurukshetra war and rest was history. Duryodhana thought Arjuna was foolish and idiot but he was an original idiot and foolish. He did the biggest mistake by sitting at the head because of his ego. But even though if he got the first choice he would surely pick 10000 men. In either way, he was proved as foolish and did the biggest mistake which destroyed Kauravas in war. This was Mistake Of Duryodhana Which Caused His Defeat in Mahabaratha. 1) Avoid Ego and Angry and Foolishness in life to get success. 2) Maintain Friendliness and Intelligence to get success.